Larlin's Home Improvement has long understood that accessibility equipment helps individuals remain safe while mobile. 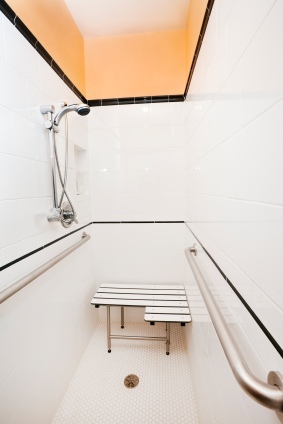 Installing grab rails, wheelchair ramps, and sturdy shower / tub seats is an ideal way to add security for those who are handicapped or desire assistance. Since 2004, Larlin's Home Improvement has been installing accessibility equipment according to ADA Accessibility Guidelines for proper, secured mounting to ensure every individual's safety. Experience – The professionals at Larlin's Home Improvement have the tools, and experience necessary to build or install ramps, for your wheelchairs, scooters and other mobility transports. They can install grab rails along walkways, stairways, bedside, toilets, sinks, and showers and tubs. Larlin's Home Improvement can install sturdy shower/tub seats to provide comfort, safety, and mobility while bathing, and easy ingress/egress ramps for wheelchairs in and out of shower stalls. Affordable – Larlin's Home Improvement installs securely mounted grab bars, wheelchair ramps and other accessibility equipment at affordable prices. The Larlin's Home Improvement professionals work with the homeowner to ensure installation specifications meet the individual's requirements, such as mounting bars at an ideal height and angle. Larlin's Home Improvement strives to provide premium equipment installation services at competitive prices. Satisfaction Guarantee – For the last 15 years, Larlin's Home Improvement has stood behind all the work they perform, and offer customers a satisfaction guarantee. Call Larlin's Home Improvement at (203) 267-0607 to receive your free accessibility improvement quote today!